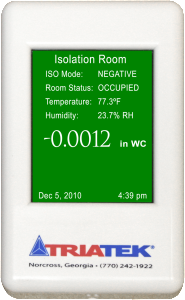 Triatek’s FMS-1655 Room Pressure Controller controls the airflow patterns, temperature, humidity, and room pressure of a critical space. 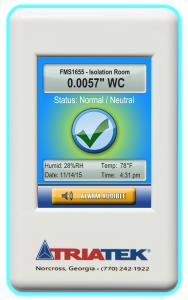 The FMS-1655 protects patients, visitors, and healthcare workers by mitigating dangerous airborne pathogens, and enables your facility to adhere to CDC®, ANSI®, ASHRAE®, and OSHA® standard guidelines for healthcare ventilation. The FMS-1655 features Triatek’s signature Safety Halo™ – a glowing, color-coded edge lighting that provides 180° of status visibility, and allows users to monitor their critical spaces with a simple glance, which is especially convenient for long hospital corridors. 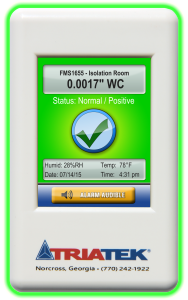 The FMS-1655 is ideal for isolation rooms, surgery suites, clean rooms, laboratory spaces, and other similar critical environments. 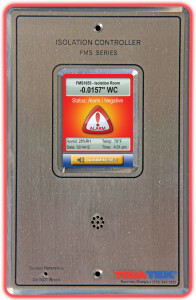 It is available in surface mount or the sleek stainless steel flush mount for busy hallways. 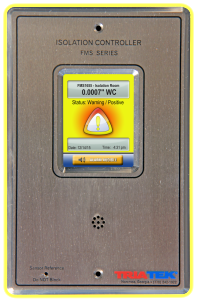 The FMS-1655 easily integrates into any building automation system. Triatek offers the FMS-1655 for the BACnet® and Metasys® N2 networks, and the FMS-1655L* for the LonWorks® network. 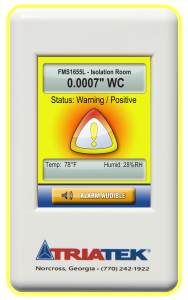 *The FMS-1655L model includes a subset of the features of the FMS-1655. Consult with the factory for details.